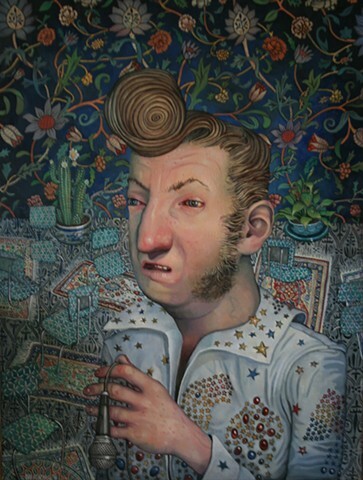 This painting tells the story of an Elvis Presley impersonator. He stands alone in a vacated room, caught in the last throws of his song. Both his expression and the limply hanging microphone suggest a vain attempt at a seductive pose and also his hopeless submission. The background, akin to a carelessly assembled Klimt painting, hint at disorder and confusion not only in the setting itself but in the mans state of mind. The chairs, with their distorted legs, appear to be the only ones left dancing to his music. The narrative as a whole touches upon the strange nature of idol worship. The seemingly commonplace need to live ones life through another.